Writer Geoffery Kaicher explores the latest notebook offerings from Apple. Last week, Apple released their new MacBook’s and MacBook Pro’s. Both notebooks feature a number of new innovations including aluminum cases, faster processors, better graphics cards and an all glass multi-touch pad that has no dedicated button. 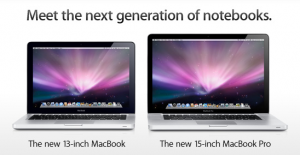 Along with the MacBook and MacBook Pro, the MacBook Air was given a small speed bump. 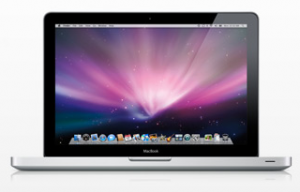 The MacBook Air now has a 1.6 GHz Intel Core 2 Duo processor upgradable to 1.86 GHz. It was also given a new NVIDIA GeForce 9400M graphics card. The MacBook went through the most drastic change going from the plastic white or black case to a new aluminum case with a black, glass screen which resembles the screen from the iMac. The aluminum case comes from a single block of aluminum machined to perfection. Even the sleep indicator was taken in to account being carved by a CNC to thin the metal before a laser make small perforations to allow the LED Light to shine through. While the MacBook and MacBook Pro look similar with the exception of screen size, slightly different port configuration and the tags on the bottom of the screen, their tech specs make them seem like there is no relation. The MacBook comes in one size, 13.3″, but has two options of processor power. With the new computer, you are given the option of a 2.0 or 2.4 GHz Intel Core 2 Duo processor. The 2.0 GHz comes with the option of upgrading to a 250GB HD, 320GB HD or a 128GB SSDfrom a 160GB HDD wheres as the 2.4 GHZ comes standard with a 250GB HD with the option to upgrade. Both options come with 2GB (Two 1GB SO-DIMMS) of SDRAM but can support up to 4GB. The new graphics support is a NVIDIA 9400M graphics processor 256MB of DDR3 SDRAM. As usual it still comes with an iSight, Bluetooth, and 802.11n Wi-Fi. The MacBook Pro, as usual, is similar same, but faster. The redesigned Pro again only comes in one size, 15.4″ (17″ apparently will follow eventually) with two processor speeds. The options are a 2.4 GHz or 2.53 GHz Intel Core 2 Duo upgradable to 2.8GHz. The 2.4 GHz model comes standard with 2GB of SDRAM, 250GB HD, and a NVIDIA 9400M 256 MB or 9600M 256MB. The 2.53 GHz model comes with 4GB of SDRAM, 320GB HD, and a NVIDIA 9400M 512MB or 9600M 512MB. Both can hold up to 4GB of SDRAM and have an option of a 128GB SSD. And as before, they both still come with an iSight, Bluetooth, and 802.11n Wi-Fi. The new models have been given a complete makeover both internally and externally. While the MacBook has been given the biggest makeover going from the plastic casing, both have been given a refined look. But in case you decide you don’t like the new laptops, Apple still offers the old 17″ MacBook Pro model and 13″ MacBook model. Editors note: Commenting on this article does not make you eligible for theiLife birthday celebration raffle. I stopped in at my local Apple Store and checked these bad boys out. They are nice, but the glass glossy display is only good if you are vain and like looking at yourself and or the room around you (spy feature?). The colours are amazing but really the lack of Firewire and the glossy display (shall I say mirror) are deal breakers for me. The easily removable battery and hard-drive (I actually removed both in store, nice Apple employee did not mind) are really convenient. The Speakers seem to be good on both, small yet noticeable improvement on the MB but it seems the same on the MBP. Both the MB and the MBP feel extremely solid. Wow. The uni-body is an amazing feature. The glass trackpad is slick. It feels great and I did not notice a change in how I used the trackpad itself. The muli-touch features are great, especially application switching. Did I mention the MacBook does not come with FIREWIRE ! ! ! ! Seems they are both warm machines. The iSight and mic are hidden nicely. The battery indicator is a nice feature now that it is accessible on the side. That all i’ve got to say. Sticking with my Black MacBook Late 2006, and will now be buying a MacPro instead because I cannot stand the glossy display, lack of firewire on the MP and the black keys on the aluminum finish (UGLY). You make a lot of good points. I agree with you on virtually all of them. Right now, I’m very happy with my (top of the line) MacBook Pro 4.1 [the previous generation] so I’m not angry about the switch.